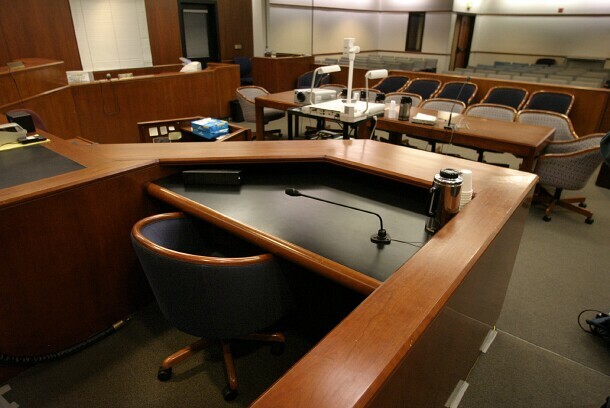 Courtroom from behind a witness stand. A California attorney who appeared in court on behalf of a client one day after being suspended for failing to pay his bar dues was given a recommended additional 60-day suspension by the State Bar Court of California. Even though John Joseph Fuery practiced law for almost 20 years without being disciplined, the court said it was recommending the suspension because it was concerned by his lack of insight into his own behavior. Fuery characterizes himself as the victim, showing he’s not able to “understand that his own actions have led to these proceedings,” the court said. In December 2014, the state bar sent the first of several 2015 bar dues notices to Fuery, which was returned as undeliverable. Then the state sent an email reminder to his email address, which he received. Several more mailings went unanswered and so the bar suspended him on July 1, 2015. On July 2, Fuery appeared in court on behalf of a client and on July 8, requested discovery in that matter from the local district attorney. He was ultimately reinstated after his father paid the bill. However, a disciplinary hearing found that by appearing in court as well as requesting discovery while suspended, Fuery had engaged in the unauthorized practice of law, which also establishes moral turpitude under state conduct rules. On appeal from the ruling, Fuery said he had been diagnosed with a brain tumor and hadn’t fully comprehended the situation. “We reject that argument because the record shows that Fuery was well enough to take on two clients and appear on their behalf in court,” the court said. It also rejected what it characterized as Fuery’s “victim” mentality because he argued that the proceedings initiated against him were politically motivated. This lack of insight into his own behavior counts against him because of the concern he could repeat the conduct, the court said. The court thus recommended that the California Supreme Court ultimately suspend Fuery for 60 days, and that he take the Multistate Professional Responsibility Examination within one year of the state high court’s order in the matter. The case is In the Matter of John Joseph Fuery, Cal. State Bar Ct., No. 15-O-14149, opinion, 3/29/19.